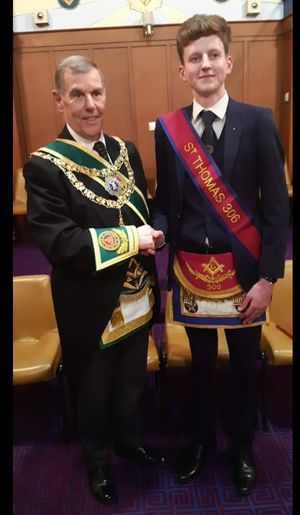 Bro Billy McPheat had great pleasure in attending a special meeting at Lodge St Thomas 306 Larkhall, where a team of Reigning Masters from the Province of Lanarkshire Upper Ward headed by RWM Bro Callum Beattie 236 conferred the 3rd Degree on one of Lodge St Thomas 306 Fellow Craft freemasons. The evening was enhanced by deputations from the Provincial Grand Lodges of Lanarkshire Upper and Middle Ward who were headed by Right Worshipful Provincial Grand Master Bro. Bill Perry. A further distinguished deputation from the Grand Lodge of Scotland led by the Most Worshipful Grand Master Mason Bro Wm Ramsay McGhee was presented to RWM Bro David Faulkner who welcomed the Grand Master and Grand Lodge Officers into the Temple. 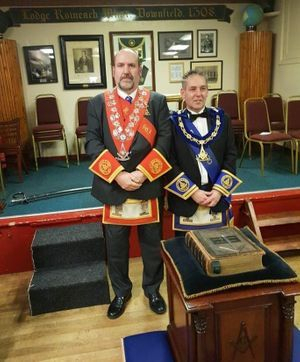 This unique event was witnessed by over 100 Brethren, who were treated to a most wonderful rendition of the 3rd High and Sublime Degree of a Master Mason, to which I am sure the candidate will remember for many years to come. At the conclusion of the ceremony all Brethren were cordially invited to attend the Lodge harmony in the lounge. A truly excellent evening was had by all and I thank RWM Bro Dave Faulkner for their kind hospitality. 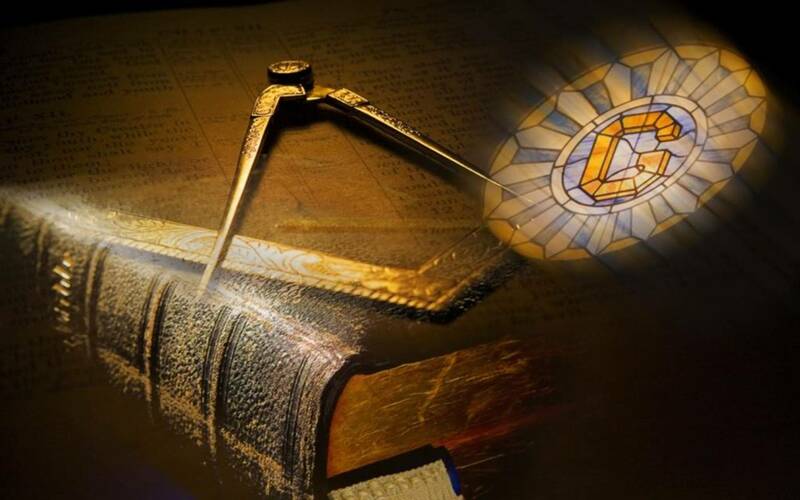 Bro Billy McPheat and PM Bro Andy Chalmers attended Lodge Coltswood Glenboig 1067 this evening 4 April. We both wish thank RWM Bro Iain Reid and the Brethren for the warmth and cordiality of the welcome we both received. We were treated to a truly excellent rendition of the 3rd degree, carried out by RWM, PMs and Office bearers of Lodge St Thomas 306, without doubt one of the best renditions of the 3rd degree I have witnessed in 25yrs in the craft, well done to the RWM and his team for a great night. Thanks again to the RWM and Brethren of 1067 for their excellent hospitality and harmony, we look forward to visiting again in the not too distant future. It was great pleasure and honour that the RWM Bro. 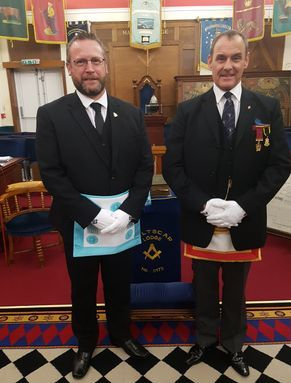 Jim Durning had the opportunity to attend the Ceremony of Installation at Lodge Hilton St Andrew 1220 in Dundee, where he received a warm and cordial welcome from RWM Bro. Chris Mulholland and the Brethren of 1220. The installation was carried out in excellent fashion by the installing board and work was a treat to behold. The RWM thoroughly enjoyed the occasion and conveyed fraternal greetings from the Brethren of Lodge Whifflet St John 963. I would like to thank all of my deputation who accompanied me on my first deputation to my Mother Lodge of Coltswood Glenboig 1067, where we received a very warm welcome from RWM Iain Reid and his brethren. As was mentioned in our worthy treasurers bro John Hunter reply to the very kind vote of thanks by RWM Kenny Roberson from lodge Caldercruix 1314, our lodge took the 2nd half of last year out to get back to basics and work hard on our degree work. It was a pleasure and reassuring to carry out our first degree work of the year amongst great friends and in a relaxed atmosphere. I was delighted to preside over the degree team last night and see the hard work they have put in come good. Once again thank you to RWM Iain Reid and his brethren for the warm welcome and excellent harmony. To my own brethren, thanks and keep up the hard work. See you all on Tuesday at our own regular meeting. Bro. Billy McPheat had the privilege of being invited to witness a Master Masons degree in Lodge Saltscar 5173, Redcar in the Province of Yorkshire North and East Ridings under the Constitution of the Grand Lodge of England. An excellent rendition of the 3rd degree was carried out by WM Bro. Gibson and his Office Bearers, the vote of thanks and fraternal greetings were conveyed in the usual manner before retiring to the Festive Board. An excellent meal and refreshments were served at the Festive Board along with the requisite toasts of the evening. Bro McPheat was invited to reply to the toast to the visitors to which he offered a suitable response which was well received by the WM and Brethren. A truly wonderful night was had by all in attendance and Bro Nick Green thanked the WM and Brethren for raising him the 3rd degree. Bro Billy McPheat was presented with a province lapel badge by the Lodge Secretary to mark the visit for which Bro McPheat was sincerely thankful. Fraternal greetings were again conveyed to the WM and all were thanked for their kind hospitality.